ORANGE COUNTY, Calif., Aug. 30, 2016 -- Today, Montage Hotels & Resorts, in partnership with Crescent Communities and The Athens Group, announces the final phase of expansion and the grand debut of its first east coast resort. The $100 million newly-expanded resort is set within the 20,000 acre Palmetto Bluff community, a historically rich centuries-old maritime forest surrounded by 32 miles of riverfront. Montage Palmetto Bluff now includes a total of 200 guest accommodations, six dining experiences, three distinctive pool venues, Spa Montage, Paintbox children's program, 35 private Montage Residences and over 16,000 square feet of meeting and event space. "We are thrilled to debut the complete expansion of Montage Palmetto Bluff and bring our signature style of service and Montage programming to the inspiring and culturally-rich destination of Palmetto Bluff," said Alan J. Fuerstman, founder and chief executive officer, Montage Hotels & Resorts. The largest undertaking of the expansion was the development of a new Inn, which sits along an expanded lagoon waterway and was inspired by the R.T. Wilson, Jr. mansion built on the property in the early 1900s. Developed by The Athens Group and designed by world-renowned Hart Howerton, HKS Hill Glazier Studio and Wilson & Associates, the Inn includes guest accommodations, a lively lobby lounge, the new Jessamine restaurant and Octagon Bar & Gathering Place. The Inn is also home to Spa Montage, which features outdoor relaxation areas that include both hot tubs and cold plunge pools, eucalyptus steam rooms and redwood saunas. The backyard of the Inn features two new pools and lagoon-side dining at Fore & Aft. The design throughout the Inn is coastally-inspired, and the furnishings, art and accessories reflect the subtle colors and natural surroundings of the resort. Montage Palmetto Bluff accommodations include spacious cottages, guest rooms and suites that reflect the ultimate in refined elegance and luxury. Guests can take in serene waterfront views from a screened-in porch, or enjoy the beautiful views of a maritime forest. All accommodations feature photographs by Eric Horan and paintings by local artist West Fraser, a native of Hilton Head Island whose work celebrates the calm, natural beauty found throughout Palmetto Bluff. The new resort expansion complements a wealth of existing amenities throughout the surrounding community including the May River Golf Club, a Jack Nicklaus Signature Golf Course, Palmetto Bluff Shooting Club, Wilson Landing Marina, Longfield Stables and the Palmetto Bluff Conservancy. "Montage Palmetto Bluff authentically represents the heritage of the destination and we are excited to bring it to life as we welcome visitors from both our local community and around the world," said Fuerstman. The expansion also includes the new Montage Residences Palmetto Bluff. Montage will offer a limited collection of 35 single-family homes ranging in size from 2,200 to 4,200-square feet and two to five bedrooms. All were carefully designed by acclaimed local firm, Pearce Scott Architects to preserve the natural environment and maintain its sense of place. With traditional Lowcountry architecture that embraces an indoor-outdoor lifestyle, homes feature airy sitting rooms, spacious porches and cozy fireplaces. Currently available for sale starting at $1.4 million, each residence offers owners exclusive access to the full amenities and services of Montage Palmetto Bluff. For more information, please visit www.montagehotels.com/palmettobluff and follow @montagehotels on social media. Montage Palmetto Bluff is located within Palmetto Bluff's 20,000 acres in the historic community of Bluffton, South Carolina. 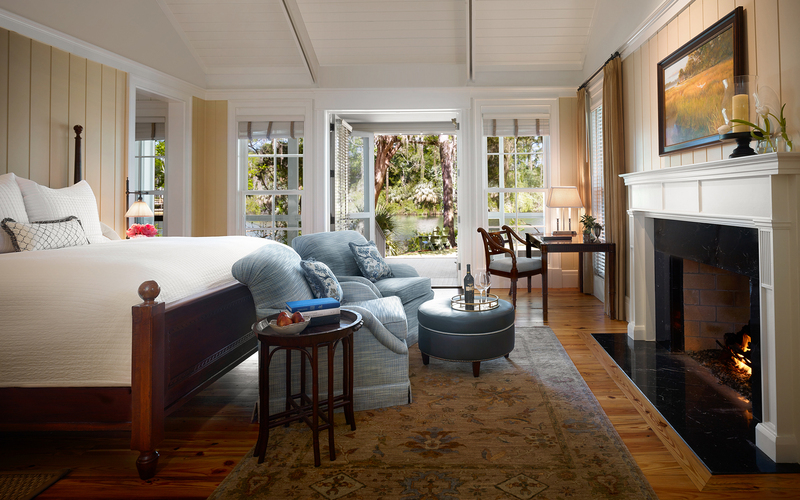 The resort offers 200 guest accommodations in the form of spacious cottages, guest rooms and suites that reflect pampered luxury in an exceptional Lowcountry setting. The resort features six innovative dining outlets; a 13,000-sq. ft. Spa Montage; recreation amenities and activities including The May River Golf Club, a Jack Nicklaus Signature Course; and 16,000-sq. ft. of flexible meeting and event space. For more information or to make a reservation, please visit www.montagehotels.com/palmettobluff. Montage Hotels & Resorts is a hotel and resort management company founded by Alan J. Fuerstman. Designed to serve the luxury traveler and homeowner, the company features an artistic collection of distinctive hotels, resorts and residences in stunning settings that offer comfortable elegance, a unique sense of place and spirit, impeccable hospitality and memorable culinary, spa and lifestyle experiences. The portfolio of hotels, resorts and residences includes Montage Laguna Beach, Montage Beverly Hills, Montage Deer Valley, Montage Kapalua Bay, Montage Palmetto Bluff, and opening in 2018, Montage Los Cabos. In 2014, the company launched Pendry Hotels, a new luxury brand that will be each destination's most inspired guest house. Pendry San Diego will open late 2016 and Sagamore Pendry Baltimore will open early 2017. In addition, the company also operates some of the country's premiere golf courses, including Spanish Peaks Mountain Club in Big Sky, Montana and The May River Golf Club in Bluffton, South Carolina. For more information, please visit www.montagehotels.com. Founded in 1969 in Charlotte, Crescent Communities is a diversified real estate investment, development and operating company dedicated to enhancing the quality of life for people through sustainable multifamily, residential and commercial communities and responsible land management. Crescent's portfolio today includes 27 master-planned communities, including its signature Palmetto Bluff, as well as 19 multifamily projects with 5,420 units under construction or in pre-development. The company owns and manages approximately 45,000 acres, including 800 acres zoned for commercial use. For more information, please visit: www.crescentcommunities.com. Palmetto Bluff is situated in the Lowcountry of South Carolina between Charleston and Savannah, Georgia. Palmetto Bluff is the largest remaining waterfront property on the East Coast and part of the Crescent Communities residential real estate portfolio. Currently evolving as a residential community and conservation preserve, the 20,000-acre development is surrounded by 32 miles of riverfront and features extensive nature trails; a vibrant Village center complete with river access, boat storage and canoe club; a distinctive food and beverage program; the AAA Five Diamond Montage Palmetto Bluff resort; and a Jack Nicklaus Signature Golf Course. An array of southern-style residential neighborhoods ranging from multi-million dollar legacy family compounds to more traditionally sized, single-family lots are currently available. The Athens Group, headquartered in Phoenix, Arizona is a full-service real estate development company specializing in the development of upscale resort communities, luxury resort hotels, golf courses and redevelopment projects. A hallmark of The Athens Group is its dedication to environmental and cultural sensitivity with each development project it pursues. The Athens Group has developed three properties with Montage Hotels & Resorts. The first, Montage Laguna Beach, opened in 2003 and received the prestigious Urban Land Institute (ULI) Award for Excellence: The Americas. Montage Beverly Hills opened in 2008 and Montage Deer Valley opened in 2010. Other acclaimed The Athens Group projects include Four Season Hualalai Resort, Big Island, Hawaii; Ritz-Carlton, Bachelor Gulch, Colorado; Ritz-Carlton Resort in Half Moon Bay, California; and Loews Ventana Canyon Resort, Tucson, Arizona. For more information, visit www.athensdevco.com.